Because relevance can be yours, regardless of your age. The term “generation” was traditionally used as a way to refer to a group of people born and living during the same period of time, which usually spans 15 years. But the idea that the people who make up a generation share a defined set of characteristics only sprung up in the mid-20th century with the recognition of the large and influential Baby Boomer generation. But when there are hard lines drawn between decades, and terms such as Boomers, Gen X, and Millennials start to infiltrate the way we think about the workplace; how we make career decisions; and what we think about our coworkers or employers, disillusionment, apathy, or even entitlement starts to define our career trajectory. You may be a millennial or Gen Z reading this, thinking “ Hey, at least I’m in the spotlight!” Or perhaps you’re more experienced- working in senior management, potentially considering retirement – and you incrementally feel there’s no place for you in today’s workplace. No matter what age you are, it comes down to this: as long as you allow your career choices to be defined by a generational moniker, at some stage you’ll become irrelevant. The answer to avoiding this inevitable career decline? Say yes to a new community of professionals. A community of globally-minded individuals who are inspired by learning, driven by change, and defined not by their age but by their desire to differentiate themselves in a disruptive and evolutionary workplace. They’re collaborative, tech-savvy, intellectually stimulated and will not accept career stagnation. They desire to cultivate an always-learning mindset in others and as the workplace evolves, they’re here to make sure you evolve with it. 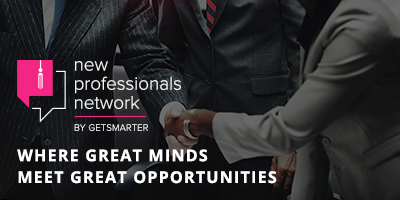 But this network is not just a lifestyle or a mindset – it’s a tangible space where great minds meet great opportunities: The New Professionals Network. Created to give you access to a multitude of career-accelerating tools, lectures, a speaker series, and the opportunity to continue your journey of lifelong learning. How do I join the New Professionals Network? The moment you complete an online short course with GetSmarter, you demonstrate your ability to look beyond generational confines and, instead, set your sights on becoming a new professional. All current and past students of GetSmarter courses get to join a global and diverse tribe of like-minded individuals and can start to enjoy the many benefits available exclusively to members, geared towards helping you stand out from the crowd and furthering your learning journey. One of the first benefits? Access to the official New Professionals LinkedIn Group. Please note: this group is exclusive to GetSmarter past students.